UK Athletics (UKA) has called for changes to Britain's tax laws after sprinter Usain Bolt pulled out of a London meeting for financial reasons. The Jamaican will miss August's Diamond League event at Crystal Palace because of the tax bill he would face. "It is regrettable ... that British fans are denied the chance to see this amazing talent," said a UKA statement. "We are, with other sports, continuing to work towards a resolution to secure his presence at our events in future." 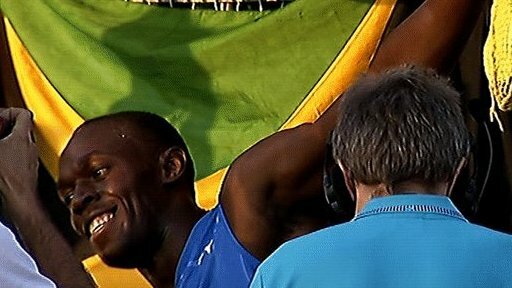 Triple Olympic champion Bolt, 23, pulled out of the showdown with rivals Asafa Powell and Tyson Gay because he would have to pay a 50% tax rate on his appearance fee, as well as a proportion of his worldwide earnings, despite his not living in the country. The existing tax law led to Wembley missing out on hosting football's 2010 Champions League final, although changes have now been implemented which have enabled the stadium to host the 2011 final and they also cover the 2012 Olympics. Sports Minister Hugh Robertson told BBC Radio he was "happy to look at it and see if I can help," if there was a particular issue preventing Bolt's appearance, but he thought it was unlikely the rules could be changed in time for this year's Diamond League meeting on 13-14 August. "I've not had a direct approach from either the sport's governing body [UK Athletics] or the promoters of the Crystal Palace meeting [Fast Track] so I don't know exactly what we are dealing with here," he said. "It is a problem we have come across and addressed with other sports and clearly if they write to me I will take it up with the treasury. "Golfers and tennis players have come to me, and I'm pretty sure that at the back end of the 2012 Olympic bill is a commitment not to tax overseas stars who come over to compete in the Olympics."